I have never been a great believer. When it comes to belief I have always been on the side of caution. It may have been my catholic upbringing and the deeprooted hypocrisy that comes with this religion that has led to a profound mistrust of firm believers. I would even go as far as to state that I am convinced there should always be room for doubt. I won't come as a surprise that my attitude towards religion is somewhere between serious suspicion and extreme wariness. And certainly I draw the line at religious groups claiming to be superior or better than others, and firmly oppose any sects, extremists or religious nuts claiming to belong to the "only acceptable religion". I mean, if you are going to be religiously inclined that's fine, but don't bully others into involuntary partaking in your convictions. And I don't mean I am immune to the reasons that lay at the basis for belief and religion: fear of the unknown, lack of control of one's destiny and fate, uncertainty, insecurity and the sense of insignificance within the enormity of all. A country that has been at the forefront of the rivalry between religions for quite a while now is Nigeria. As far as I know (and I realise I am very much limited by the minimal coverage of Nigerian affairs in western media!) this has only led to a violent struggle in the last few years. In music we have come to know both strong believers of the Christian faith, like juju-stars King Sunny Ade and (the reformed) Chief Ebenezer Obey, and devout Muslims, such as that hero of apala music Alhadji Haruna Ishola. In this post I would like to share with you exponents of both Christianity and Islam. 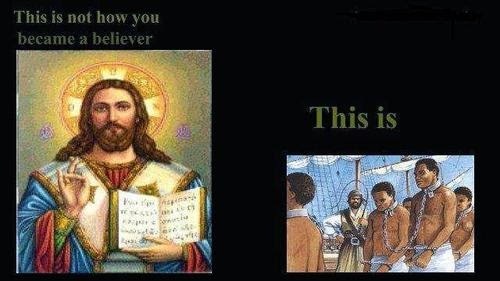 And in both cases with an explicit focus on their respective religion. Islam is represented by an album by the Muslim Carol Singers, led by brother Latifu Fagbayi Oloto. I bought this record in the mid-1980s at Stern's, and I gather they were glad to get rid of it, as there was an overcrowding of similar albums in their shelves. It has been an album that has raised eyebrows, evoked some curiosity, but one that has not been copied a lot. The music is in a style that at times borrows from fuji and at times from apala. 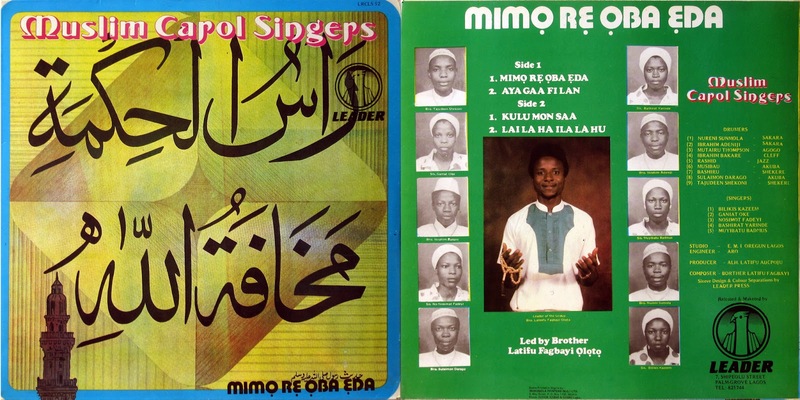 While I like the choruses, I am not too impressed by brother Latifu's contribution. The best track, if you ask me, is the title track (B1). In apala style, but not in the same league as the great Alhadji Haruna Ishola. The music never gets off the ground, never really flows. Representing Christian faith is a group with some mystery attached to it. 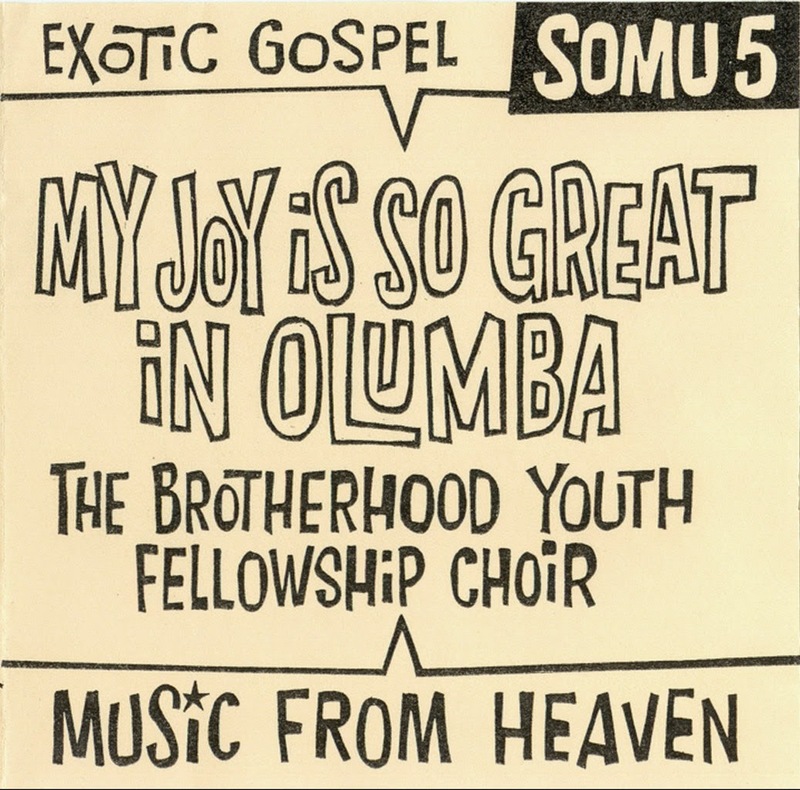 The CD is credited to the Brotherhood Youth Fellowship Choir, but the publisher leaves some doubt if this is indeed the gospel choir which can be heard in these 21 songs. The songs are copied from cassettes bought in 2000, but probably recorded in the 1970s. This is a capella music in the strictest sense of the word, so no instruments and as in a church (i.e. "a capella"). The titles are largely unknown or have been added by the publisher. I can only agree with the producers of this CD that this is music worth preserving. The chorusses are simply wonderful, if not heavenly. I just love the harmonies in these songs and the great variation in combining the very individual voices. There is a lot to be discovered, even after repeated listening. While the joy of these great singers oozes out of music, this is a compilation that rises above the religious content or the religiousness of its lyrics. "Music from heaven"? If there is such a place I wouldn't mind hearing this music there! to be opposing points of view, albeit by the same persons. Our present Dutch government, for example, sees technology as the main driving force behind the economy, while at the same warning against loss of jobs as a result of increased automation and computerisation. In the meantime millions (and more) are lost on computerisation projects failing. I can imaging how this would lead to economic gain, in the same way that bombs and ammunition are a economically very profitable venture, - from the purely capitalistic point of view of the manufacturer at least (boom!! - and it's gone). In my experience automation projects have a strong tendency to fail for one reason: the human factor. On the one hand suppliers of the automated solution are inclined to impose their wonderful 'technical advancements' on the future users, while on the other hand users are simply unable to visualise the end-result. Unfortunately this often leaves the suppliers to do whatever they want or see as "the best solution for the customer". The idea that the final product requires an intricate knowledge of technology does not occur to the supplier, while the user doesn't want to be caught out as a digital dunce. The balance between supplier and user is disturbed even further by present-day managers, for whom staff is mostly seen as a negative influence on profits and automation as the best way to correct this. In music we have seen a similar move towards automation. The extreme exponents of this musical rise of the machine are the Tiësto's, Armin van Buurens and Afrojacks* of today. Skilled artists have been replaced by a single person mixing their music using machines. The rise of the machine in music started way before the rise of computers. 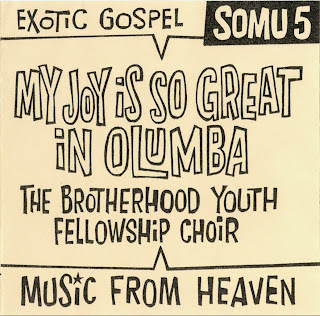 The relative innocent Solovox organ, introduced into African music in the mid-1950s, at least added a new sound. The same can be said for the organs used in the 1970s and 1980s. Generally they were used as an adornment and not as a replacement for other instruments and their players. That is: not until this was demanded by western producers. Several musicians I talked to in the 1980s told me that there was always a limit to the number of persons they could take on a tour. So at a time when many musicians travelled outside Africa for the first time and became known to a western public, they often performed with reduced formations. This became more of an issue in the second half of the 1980s. Groups were more than often 'completed' by local artists or musicians; at first by countrymen of the imported performers, but later on by (at best) native professionals or (even) native amateurs. This trend coincided with cuts on another level: the often impressive horn sections were replaced completely - you guessed - by machines. One may argue that we were lucky to see artists in the first place. But let me refute this with this question: how would you feel if the horn section in a concerto by Mozart was replaced by a synthesizer? Personally I have objected to the replacement of those lucious horn sections by the constipated sound of synthesizers since the late-1970s. And we were lucky to see the O.K. 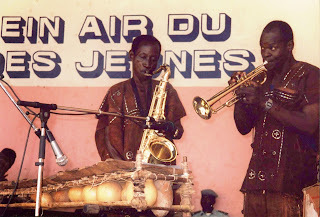 Jazz when they were still "Tout Puissant", to see Fela's Egypt '80 blowing us straight to heaven and back, to hear the suave harmonies of the horns of Super Biton, Les Ambassadeurs, Bembeya Jazz and all those orchestras that would be and are left amputated without the horns. I am sure you are wondering where this is leading to. Perhaps you expect me to post the best horn sections in African music ever, much in the vein of the top 100 (or top 10, 2000 or any other number) lists that are prevalent at this time of the year**. If so, you are going to be disappointed. For it is actually the machine I would like to focus on. The single man and his machine. The decline of the one can precipitate the rise of the other. For as the large orchestras became too complicated to bring over, too expensive to maintain on tour, and subsequently - when horns were replaced by synths - too unlike their former selves, the appeal of the lone artist grew. Initially more for the tour organisers, who saw the single musician as less of a financial risk. And gradually also for the public, often with the aid of clever marketing. When the artist was actually supported by or part of a band or group, like for example Oumou Sangaré, Salif Keita, (perhaps to a lesser extent) Zani Diabaté or you name it, the name presented to the public would still be that of the artist, making the musicians supporting the artist interchangeable (and therefore less of an economic liability). This setup, although certainly beneficial for the 'stars' involved, at times led to frustration with the more conscientious artists. I remember Ali Farka Touré (an artist with a strong feeling of cultural inheritance) expressing his annoyance about not being able to bring a larger ensemble on tour. Having seen larger (and even large) ensembles in Mali I understand his frustration. One group of musicians also benefited from this individualisation: the ones that already - and traditionally - were able to perform alone. For there was already a group of 'men with their machine'. 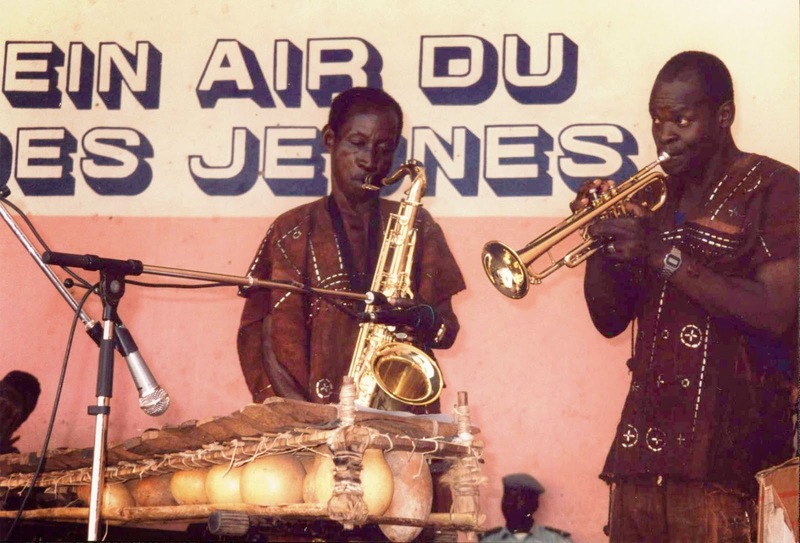 Kora players like the great Batourou Sekou Kouyaté already were self-employed entrepreneurs, while at the same time being involved in large, medium-sized or petits ensembles. This flexibility came from their machine: the kora. To accentuate the machine-like quality of the instrument I am not sharing a recording of the aforementioned Batourou Sekou, but one by the man who more than any other kora player managed to bring out the metal sound in the kora (and in his singing too, as you can hear in the album I posted before): Lalo Keba Dramé. This album, released on the N'Dardisc label, has Dramé's versions of some of the Mandinka classics covered by many of his colleagues. Typically his versions are less laid-back, more energetic, if not at times even frantic. 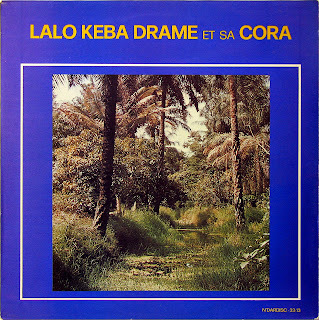 I haven't heard any recordings of Lalo Keba Dramé accompanying a female griot, and given the imposing style of his kora playing I can understand why. This is a very individual album, in a very individual style. As a special festive bonus I am adding this great video by Malian kora legend Sidiki Diabaté and his son Toumani. The son has become more famous than his father, particularly outside of Mali, but if you ask me not for the right reasons. Personally I am not a great fan of the cross-over, and least of all of kora players 'battling it out' with fading western instrumentalists in an attempt to enter into 'arty', commercially lucrative new-age circles. I do like his more modest, less pretentious work, both as a solo performer and with ensembles. But his father is of a different league and of a very different era in Malian music. An era in which the competition was fierce, and in which the influence of tradition was predominant. As far as I can gather Sidiki is explaining - to host and presenter Zoumana Yoro Traoré and to the Malian public - the origin of his machine. A truely historic document. Unfortunately I don't have the whole video, and it breaks off after 17'30. * and the fact that I only know these Dutch dj's is only because they are presented in shows on Dutch TV as Dutch celebrities. 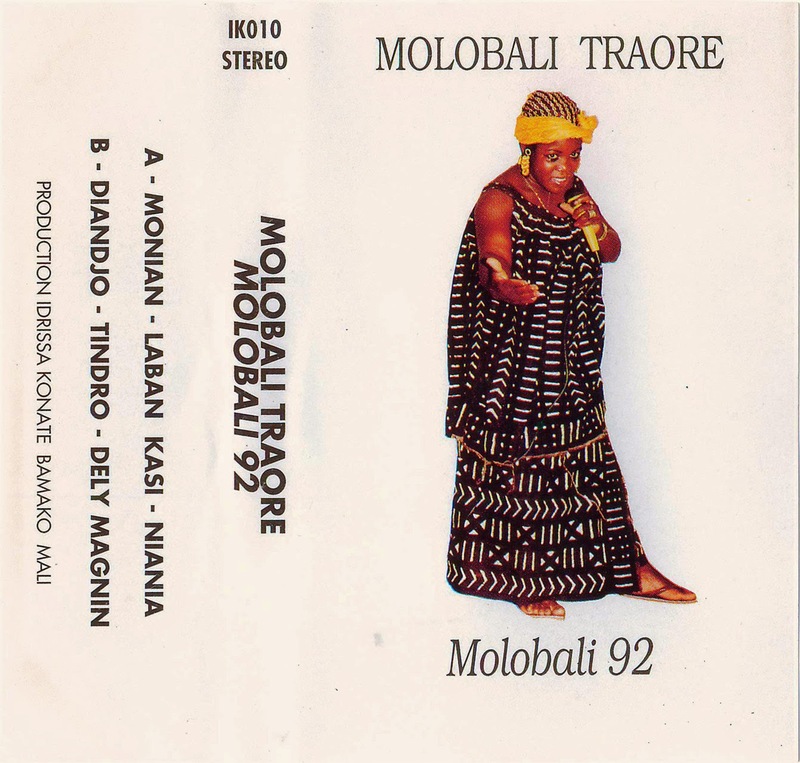 You may remember that lovely cassette by Malian singer Molobaly Traoré which I posted some five years ago. If you've missed it, please do yourself a favour and go back and listen to it. Listening to it again the other day I was immediately taken back to the dusty streets of Mali and particularly those of the Ségou region. Real music can do that. 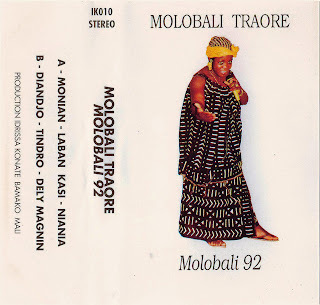 That cassette is from the early days of Molobaly's career. A career that ended far too early, with her death in 2009. The cassette I would like to share with you in this post is from a few years later. It is clear that some of the innocence which marked her earlier cassette - and which certainly added to its charm - has gone. But other elements have remained: the slight tendency towards sullenness, the faint air of gloom, the strong Bambara repertoire, - now even more accentuated by the use of the sokou (violin). There are no credits on the cassettes, but my guess is that it may well be Zoumana Tereta. You may recognise the second track, "Laban Kasi". This is a version of a song from Ségou, also performed by 'Tasidoni' Karamoko Keita. 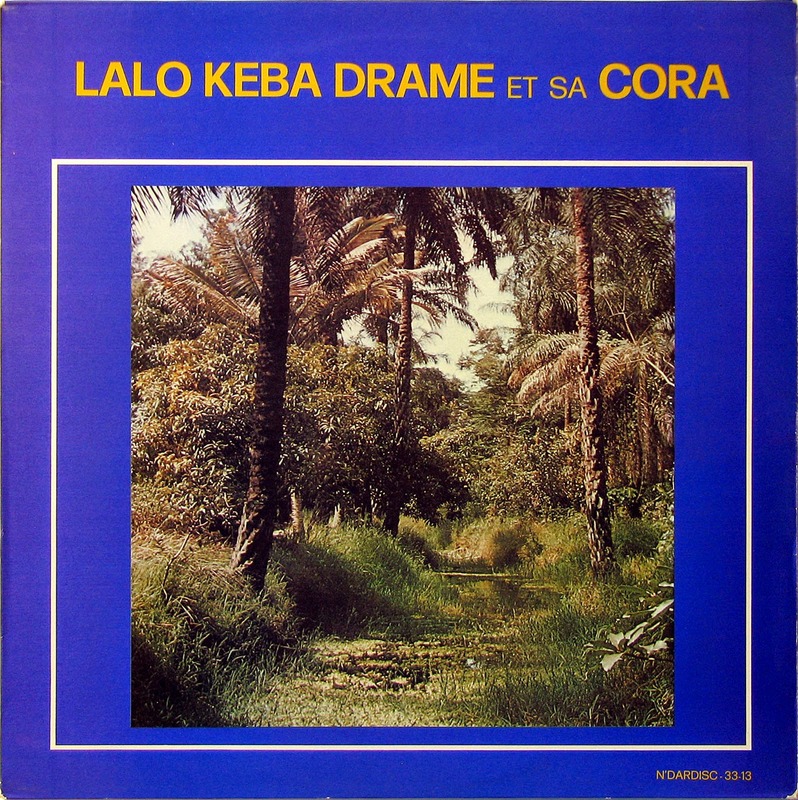 "Diandjo", however, is not a version of the song with the same title by Hawa Dramé, although the subject of the song may be the same. If you ask me this is a cassette has not lost its power over the last twenty-two years. In fact, in my personal ratings it has only grown in stature, - as Molobaly Traoré has grown with it. More of this late but great artist in a future post.